This past Monday night on Raw, former NXT Champion, Andrade made his in-ring debut on the show after moving from SmackDown as part of the Superstar Shake-Up. In what was quite the impactful debut, Andrade went one-on-one with the reigning Intercontinental Champion, Finn Balor. The match was the best match on the show. To make things even more impressive, Andrade picked up the non-tiitle victory over his opponent, teasing future matches between the two men for the gold later down the line. While Balor may have only just recaptured his title, taking it away from him and putting it on Andrade in the near future would probably prove to be best for business. The two men are likely to meet again in the ring, and once again, Andrade should walk away with the victory, with the Intercontinental Championship around his waist. Let's take a look at three reasons why that should be the case. 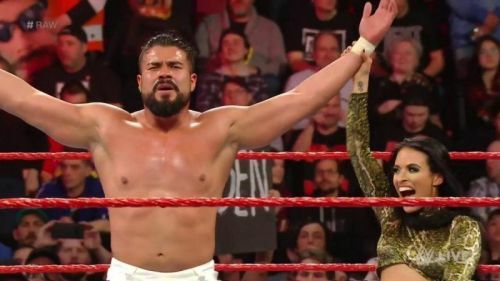 Andrade is one of the hottest young talents in the WWE right now, and there is very little doubt in anybody's mind that he could work absolute wonders with the Intercontinental Championship in his possession. His debut match on Raw against Finn Balor was an excellent example of exactly what he is capable of in the ring, and he has proven time and time again that he can put on excellent encounters with anyone on the roster. Outside of his exceptional in-ring talent, the former NXT star also has buckets of charisma to spare and could really help extract the best out of some of his opponents on Monday nights as well. It has been almost a year since Andrade made his debut on the main roster, and he has more than paid his dues - in terms of putting people over and making others look good since then. He has firmly established himself as one of the most consistent performers on the main roster, and surely it is only a matter of time before the higher-ups in the company recognize that.